RLBS Building Facilities Limited can provide a wide range of electrical services from repairs and installations down to basic lamp changing. We operate within commercial properties throughout the South West. We provide all types of electrical installation work from simply replacing or adding sockets, fuse board changes, electrical rewires, external lighting, through to large 3 phase installations. We are approved by the NICEIC for all types of electrical works. 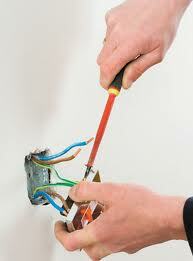 All electrical wiring requires testing on a regular basis. RLBS Building Facilities Limited can provide a program of testing and inspection to ensure as far possible no danger results from the use of portable appliances and power supply deterioration. Employees and General Public are exposed to health and safety risks on a regular basis, mainly resulting from faults on cables, switches, sockets, fuse boards and other equipment as they deteriorate with prolonged use. RLBS Building Facilities can provide PAT Testing (Portable Appliance Testing) testing as part of our services to new and existing clients. PAT testing is a documented system of electrical maintenance which companies are required to undertake periodically on all their portable electrical appliances. Why Do Portable Electrical Appliances Need Testing? • Adherence to the Health and Safety at Work Act 1974 and compliance with the Electricity at Work Regulations 1989. • Minimise electrical shock hazards due to faulty / damaged electrical equipment. • Insurance companies cannot dispute claims for damage through fire because of inefficient electrical maintenance. • Maintain the safety of employees, visitors and customers and minimise fire risks due to faulty / damaged electrical equipment. How Often is PAT Testing Required? There is currently no legal requirement of the frequency of how often PAT testing should be carried out. The Institution of Engineering and Technology (IEE) issue recommendations for the frequency of testing. The frequency of testing can vary from every three months for equipment used on construction sites to every two years for certain types of equipment used in offices. We would normally recommend testing all items annually (except for equipment used on construction sites). This approach is normally the most favoured approach as it makes planning and organising the works more straightforward and satisfies most insurance companies’ policies. Test items are labelled with an electrical safety pass sticker showing date of test, a unique item number and date of next test. This will ensure that the item can be tracked and provides a clear indication of its pass / fail status. A full electronic report is provided after for your files that indicates the results of the individual tests carried out. Failed items (deemed dangerous – e.g. electric shock or fire hazards) are removed from use, labelled and any necessary action required is discussed with the site manager for the health and safety of users.